My Journey with SQL Server….! SSAS – No mapping between account names and security IDs was done. 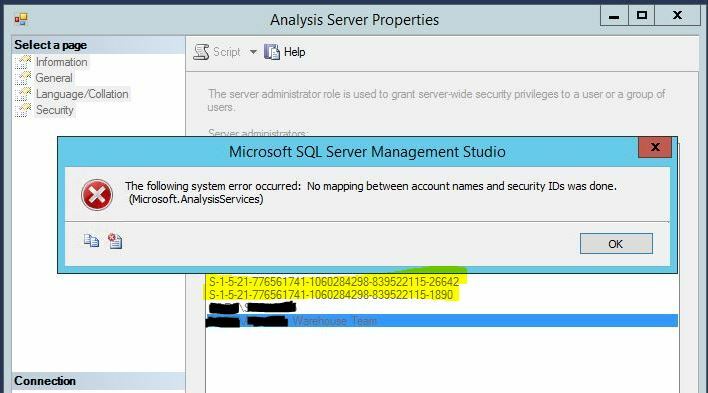 In this short blog post, Let’s see a strange error which one could encounter when dealing with permissions in SQL Server Analysis Services(SSAS). So, I was working on a DEV SSAS Instance to grant admin rights for our DW team this morning and ran into something which is very interesting. Basically I was unable to add any new AD user accounts/Groups to the server administrator role. SQL Server was throwing below error at me. The following system error occurred: No mapping between account names and security IDs was done. If you notice in the above screenshot, there are couple of stale AD accounts(Shown as random GUIDs). These accounts were added couple of years ago(These guys are no longer working here and they were deactivated in AD) and SSAS is basically validating all the accounts which are listed under server administrator role when I am trying to add a new valid account, not just the one which I am currently adding. Simple, I just removed those stale SIDs and presto!! I ran into a similar issue just few weeks ago when I was using Kerberos configuration manager where I had to remove invalid accounts(listed as Random GUIDs) from local admin group on the windows server. So there you go, if you ever run into this issue, the fix is simple, Just get rid of those garbage accounts. Next Article Locked out of sysadmin, Now what? SQL Server on Docker containers – Welcome to the present! Installing(Adding) feature(SSRS) to an existing SQL Installation! How to Add a New Disk/Drive to SQL Server Failover Cluster? AlwaysON Secondary database going to "Not Synchronizing/ Suspect" State! How to Rebuild Master Database?? AKA Rebuilding SQL Server 2008R2.